Are you still searching for the perfect gift for a special mom in your life? If so, I highly recommend Gifts.com to help inspire the perfect gift with a fantastic selection of gift ideas. In fact, Gifts.com is the #1 site for gift recommendations in the United States! Gifts.com can help you treat your mom like a queen for a Royal Inspired Mother’s Day celebration or you can make your mom feel like a Star based on the celebrity mom that is most like her. Is your mom more of a “classic” mom like Michelle Obama, a “crafty’ mom like Martha Stewart or a “Glam” mom like Heidi Klum? I had a lot of fun selecting the mom that is most like me, the “natural” mom inspired by celebrity Gwenyth Paltrow. This style includes a “natural beauty routine and healthy cooking choices with a classic fashion sense”. I was able to shop the gifts for eco-friendly recommendations and really think it is a great selection of ideas. I chose the Healthy Gift Basket Classic™ from GourmetGiftBaskets.com which includes a wonderful basket full of healthy snacks such as Honey Wheat Dipping Pretzels with a delicious Raspberry Honey Mustard Dipping Sauce, Feridies Peanuts, plump dried cranberries, a roasted Edamame & Goji Berries snack mix, organic coconut bar, organic sea salt crackers, healthy trail mix and my favorite, the Wild Maine Blueberry Jam that has no added sugar. This healthy basket ($59.99) is such a treat and arrived so attractively packaged with festive ribbon that I couldn’t stop smiling as I was able to share my treats with my beloved husband and children. 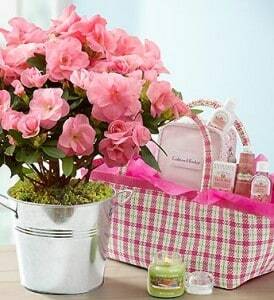 If your mom (like me) shed tears of joy at the recent Royal wedding perhaps she would love this Pampered Mom Gift Set ($79.99 from 1-800-Flowers) which includes a gorgeous pink Rozalea Plant in a lovely galvanized tin planter, Yankee Candle®-Garden Hideaway and a Crabtree & Evelyn® rosewater scented spa travel set. Can you imagine the smile that would light up any mother’s face if this fantastic gift was delivered at her doorstep? There are Mother’s Day gift recommendations for every budget, style and taste at Gifts.com. I appreciate how easy it is to navigate the site and the customer service is excellent. You can shop by occasion, category and price. I really love these Personalized Heart Stepping Stones and left several subtle hints for my husband to hopefully inspire him for my Mother’s Day gift because I would be thrilled to have these in our garden and at only $9.99-$12.95 the prices are fantastic too! Are you ready to find the perfect gift? You are invited to visit Gifts.com so you can view the entire selection of gift recommendations from Gift Guru Dana Holmes. Happy Shopping! I like the DreamWorks Animation Certificate for baby! “Today, Tomorrow And Always” 3-Diamond Men’s Ring. The double strand pearl bracelet is my favorite.